The next Fireball puzzle will appear next week. I had cracked that 36A was DO AS I SAY, NOT AS I DO, but couldn’t figure out why it wasn’t fitting in the grid as-is, or why I couldn’t find other entries with multiple DO squares. Once I realized that YOU CAN’T TAKE IT WITH YOU had the same problem, GO BACK TO SQUARE ONE revealed itself and helped BOND, JAMES BOND and NO MEANS NO slot into place. This is cleverly executed, with BA(YOU), BAIL (BOND), WAL(DO), and K(NO)BBED taking advantage of the rebus squares on the down fill. I really liked the clue “Place where beads are made” for SAUNA. “Like a sleeper cell?” was similarly great for ON SILENT. TWO-TERM, YES WE CAN, ANACONDA, ENIGMA, STARLESS, MOSAIC, CONEHEAD, and SNAKE OIL were all lovely fill. I feel like it’s been ages since I’ve seen VSOP in the NYT, so it was a welcome surprise rather than the same-old same-old fill. There are infinitely better ways to clue PEN other than “French politico Marine Le ___”, who represents the fascist National Front party. Use one of them! Have a great Thursday, all! Say no to fascists, especially when your fill doesn’t need them! Common phrases with an O have that O doubled. 17a [Just passed the bar?] SOON IN LAW. Son-in-law. 25a [Make a smoothie, say?] GOO BANANAS. Go bananas. 35a [Stashing ill-gotten gains in an offshore account?] PARKING LOOT. Parking lot. 48a [Lei?] ISLAND HOOP. Island hop. 58a [Part of a hilarious clown’s costume, perhaps?] HOOT PANTS. Hot pants. The theme boils down to “adding an O” which isn’t exactly the groundbreaking stuff we hope to see on a Thursday. It would be different if these were knee-slappingly funny or even humorous, but these didn’t do much for me. And the “hot pants” base phrase coupled with 1a OGLES, clued innocently as [Longing looks], were turn-offs for me. Plural VENOMS clued from a singular snake [Viper products]. One snake does not produce multiple VENOMS, as far as I know. ASTRO (from The Jetsons) stealing Scooby-Doo’s clue [“Ruh-roh!” exclaimer of animation]. An unusual six-letter partial at 12d GOOD AS [Words with new or gold]. The difficulty no doubt lies in the fact that we have a 13-letter central revealer which tends to result in either short, choppy corners or challenging-to-fill wide open ones. This grid features the latter variety which are mostly filled satisfactorily, but with some notable exceptions that I mentioned above. One quick fix I can see right now: A “cheater” square would be helpful at the S in VENOMS. Not only would it make that word singular, but also the crossing NOGS. On the other side of the grid, AFLAME would become FLAME and A PAT would just become PAT. That’s an improvement all-around in my book. I did like seeing LEBLANC (though I would understand if some people didn’t), LOOSEN UP, NOD OFF, and the Disney-referenced duo of MERMAN [Triton, e.g.] and BALOO [“The Bare Necessities” singer in a Disney film]. I was just at Disneyland earlier today, and my daughter was in a Jungle Book musical last month, so these felt apropos to me. I didn’t get much joy from this puzzle, but maybe others liked it better. Three stars from me. I’m being told that this puzzle is by Roland Huget based on what it says in the AcrossLite version… but online, this puzzle is called “Three and it’s by Five%22. Looks like part of the title got caught up in the byline. Weird. THEME: Three-word-phrases that make use of only one vowel. The vowels are used in A-E-I-O-U order. I’m guessing that’s the “Five” part of the title? Solid consistency with each themer being three words and utilizing only one vowel in each of the words- probably not a heckuva lot of phrases you can do that with. WALK AND TALK, STICK WITH IT, and SET THE TREND are solidly in-language. STOP SHORT OF feels weird with the preposition tacked on (STOP SHORT is more familiar). TURN UP DRUNK is certainly a way people can arrive at a party, but it doesn’t feel like a stand alone phrase to me. Also a rough start for me when I entered EGADS for 1-Across and accepted it as the without-a-doubt correct answer. So that corner turned into a temporary mess. Thanks, David and Five%22 (Roland)! Many apologies, it seems yesterday everything got totally mixed up… Today is another day though. 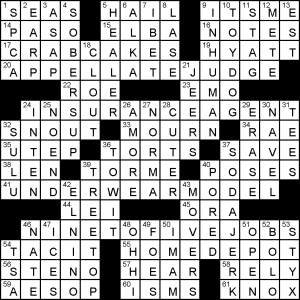 A very creative, unusual theme: the three NINETOFIVEJOBS listed are all 9/5: APPELLATEJUDGE, INSURANCEAGENT and UNDERWEARMODEL, the third being something of a plot twist. Four 14’s is not a common arrangement, and does present significant design challenges. Oddly, the constructor has gone for only 72 words, which is more typical of a themeless. That does make space for longer entries like SODAJERK (a non-9-to-5 job), HOMEDEPOT and CRABCAKES. Speaking of which, those of us who belong to LearnedLeague must have shaken our fists at the clue for 17A – [Dungeness delicacies], a recent question asked for Dungeness in relation to its crabs. This South African had no hope. [Nickname of golfer Sergio García, who turned pro at age 19], ELNINO. This is quite a golf deep cut, but the end of the clue nudges you in the right direction, implying the nickname relates to youth. An editor’s delight today — manuscript puns! 28a, ROMING CHARGES [Costs for removing font styles?]. Roaming charges. 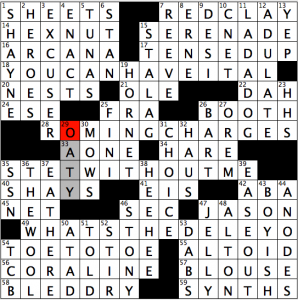 Never heard of “roming.” Does it have anything to do with Roman fonts? 35a, STET WITHOUT ME [“You don’t need my input to overrule changes in the manuscript”?]. … “Start without me,” I guess? Stretchy if so — let me know if I’m missing something here. 49a, WHAT’S THE DELE YO [“Hey bro, tell me which one of these I’m gonna strike from the galley”?]. “What’s the deal, yo” or, possibly, “What’s the dealio?”. Liked the idea, but some of the puns went over my head. Liked seeing RED CLAY, HEX NUT, SYNTHS, CORALINE, and BLED DRY in the fill. 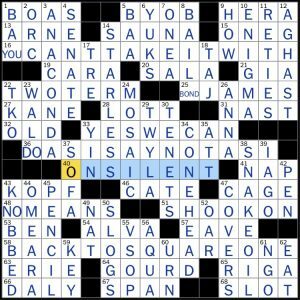 Enjoyed seeing the modern clue for STAN [Be an overzealous fan], as well as the Roz Chast quote about ERNEs: [“I also saw an egret, an emu, and an ___ who was building an aerie.” (Roz Chast on crosswords)]. That’s all from me today. Until next week! This entry was posted in Daily Puzzles and tagged Brendan Emmett Quigley, Gary Larson, Kevin Salat, Lewis Rothlein, Roland Huget. Bookmark the permalink. Absolutely agree on leaving fascists out of my puzzle. I felt the same about the racist Trent Lott. Not even Maurine Le Pen could ruin this puzzle (although I would have preferred another clue). I figured out the trick with (YOU) CAN’T TAKE IT WITH YOU; it was the shorter theme entries that made it brilliant, especially (BOND) JAMES BOND. A delight to solve. “Viper” here doesn’t need to be interpreted as a singular noun. 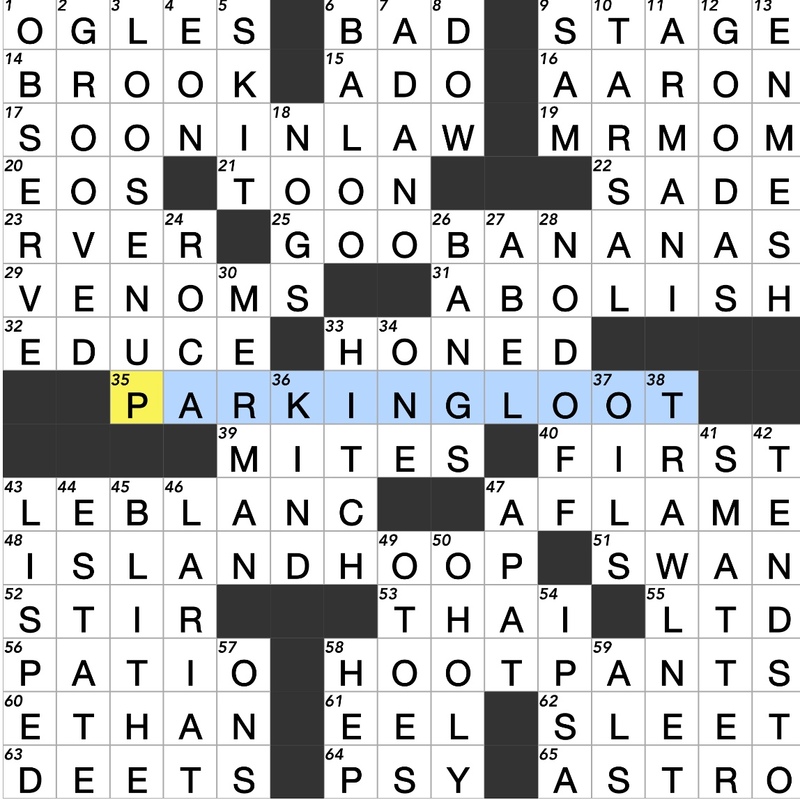 That OGLES clue, however, is indeed dreadful. NYT: Another case in which the .puz coding didn’t account for multiple letters. Some puzzle sources seem to know how to do that; others don’t. When I saw the PEN clue, I thought that maybe PEN and PENCIL were etymologically related so there needed to be an alternate, non-English definition for PEN. As that seems not to be the case, I’m not sure why you would go for a partial name of foreign also-ran over a common definition that opens you to more cluing possibilities, even leaving aside the controversy. Even if PEN and PENCIL had the same roots, I could make the case for including them in that sense in the same puzzle as a natural pair. While I’m not a fan of cross-reference clues, “Partner of 45D” might be rather nice. But if not, it’s an easy crossing to change (say, to NAM and MEN). Nice puzzle, though. WSJ, meanwhile, was definitely a no smile theme plus the awkward fill singled out in the review, all plus to my mind way too much trivia. LAT: How do 14- and 35-Across not cross-reference each other? I actually see it as a dupe. Could have redone PASO/SEAS/EARP as PESO/SPAS/PERP (for example). Ditto, I was thinking dupe as well. Kevin the constructor here. I agree it’s a dupe and I’m not super pleased about it, as I originally had different fill in that UTEP section that they had approved. I guess at some point in the editing process they made the change and didn’t pay attention to the rest of the fill. Hey Kevin, I personally don’t see it as a dupe, since it’s one letter in an initialism that didn’t really distract my solve. 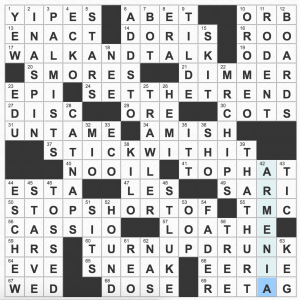 I was only curious why 14-Across wasn’t clued as, “Part of 35-Across,” or something similar. For me, a clue like that turns a “dupe” into an asset and a fortunate coincidence in the fill. Though editing can certainly explain the issue. None of this is meant to belittle the puzzle; great puzzle and unique concept overall! Have been a leftist radical all of my adult life. Complaining about Le Pen in a crossword is just frigging infantile. Amen to that! Especially if there was a concern about an appearance of a dupe. What a wonderful puzzle. WSJ: a puzzle needs to have a lot of excellent fill to justify use of the worst possible POC, the inane “switch positions.” This one didn’t, in my opinion. About the title and constructor attribution in the Universal: the online system has a bug that causes it to interpret the word “by” in the title as the start of the byline of the author (constructor). I caught it and David made a corrected .puz file for us. He reported the bug to Andrews McMeel but I guess their tech support is not as rapid-response as ours :). That makes sense! Thanks- I wonder how it appeared in print. NYT. Highly enjoyable and a little different but in a good way. Uhh, I think Astro was first. Scooby didnt appear until 1969. Did you know they were both designed by Iwao Takamoto and voiced by Don Messick? Thus the similarity.